Print one business book at a time or print in volume with offset for deeper discounts and a much lower per unit cost. Take your book to market in mere weeks. Plus you own all the rights to your book; publish it here and go anywhere. Promote yourself and your business by selling your book through Blurb or through Amazon and beyond. Choose from a range of professional-quality formats for any kind of project. For orders of 300 or more, we offer bespoke book printing, which can include foil stamping, embossing, headbands, ribbons, and custom end sheets. BookWright's easy-to-use features allow you to create custom layouts, arrange images and text with auto-alignment, and use pre-installed fonts in your print book. Already have a book in PDF format? Use our specifications calculator to fine-tune your PDF to a Blurb-friendly book size. Then simply publish and order your book. For orders of 100 units or more, we'll figure out what's best for your project—digital HP or offset printing—and give you a custom quote to save you as much money as possible. How did FUEL stand apart from the advertising agency crowd? They made a really great Blurb book to showcase their talent. It worked—and keeps working–to land them some great business. The shelf life of a book is a competitive advantage for FUEL. CATT takes advantage of Blurb's volume discounts and print multiple copies of each portfolio edition. They display copies in the office, give copies to consultants and clients, and the firm directors take the book—print or ebook—to all potential client meetings. Ive Haugeland, a principal at Shades of Green Landscape Architecture, had been looking for a portfolio solution. A book allows Haugeland to discuss ideas with clients in context and make decisions more quickly. The book has even landed the firm many new projects. "It’s a great way to get our work literally into the client’s hands and let them explore." Dodero and his partners felt they wanted to do things differently, but at the same time, they were very cost conscious. Blurb's magazine format was the perfect solution. It's the cornerstone of their 360° advertising and promotion efforts and is getting rave reviews from prospects. For the Detroit-based photographer, it was a dream assignment: A print and broadcast campaign for GMC about the connection between truck and driver. He made a Blurb photo book for promotional purposes, and an ebook of the work so that he can carry it with him wherever he goes. "The ability to create, modify, and upload books and ebooks in a quick time frame…is huge. It frees me to take care of the other elements of my business." The initial purpose of their Blurb book was to create a memento of the 2011 race for participants. But the book took off. Racers and volunteers bought the book for themselves, families, and friends with $10 from every book sale going to the scholarship fund. One hundred percent of the book's marketing was done with social media using Blurb's free digital promotion tools. Blurb's online book preview tool allowed buyers to see the quality of the book, a key factor in driving sales. "Blurb enables us to offer the book in various formats—including as an ebook. Of the 20 four-year scholarships we awarded to Maasai girls after our 2011 race, one was funded almost entirely from proceeds from our first Blurb book." The book is a perfect complement to the rich colors and inviting textures of Bella Notte. The book's quality is a big factor in communicating Bella Notte's brand. McCoy also takes an ebook version on her iPad to trade shows. The response has been so great that McCoy is now making a book after every photo shoot. Being able to tell the Deus ex Machina story in an editorial context is a key differentiator in the crowded market of lifestyle-based clothing brands. Recently Nordstrom came on board as a retailer of Deus's surf and skate clothing line. 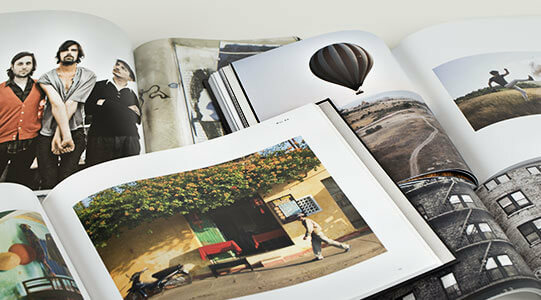 The Blurb books are a key part of the strategy to secure international distribution. To make production easy, the team went with a yearbook—big on photos and short on text. Compiling content on a month-by-month basis helped avoid an end-of-year rush. The team made a softcover book as a proof book, tweaked a few spreads, and then created a hardcover book to give to sponsors. The results were stellar. 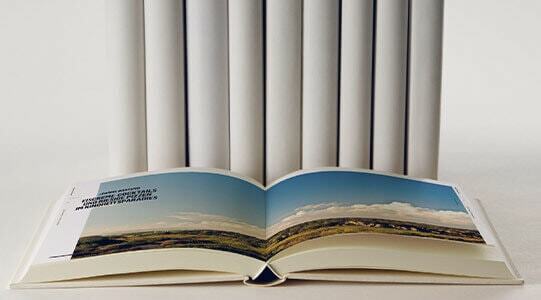 "A website is ephemeral and soon forgotten, but a well-produced book is something else. It’s valued, unique, and it’s relatively inexpensive but very much appreciated…the book met all our criteria: Price, print quality, and overall feel." "The book certainly helps us to secure work. It’s lovely to see someone’s face when you hand them the book at the end of the interview." Ready to make your business book?